Interview with pop singer Derik Fein! Through Twitter, I’ve also been communicating with other bloggers, brands, YouTubers, artists, musicians etc. It’s super easy to get introduced to wonderful people who are also publishing their work on the internet, since Twitter automatically recommends scores of the most talented, successful new people for me to ‘follow’ every day. So I guess it wasn’t much of a coincidence that Twitter led me to Derik Fein, an amazing American pop singer with a great taste in music and style. Without further ado, here goes. K: Hi Derik! It’s great to have you here. Could you tell us a little about yourself and your music, for people reading this interview that don’t yet know you? 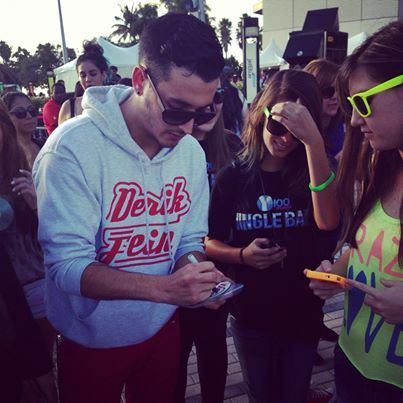 D: My name is Derik Fein. I’m a POP singer from Miami. I have an amazing fan base called #Feiners. K: When and why did you start pursuing music? Was it a lifelong dream or was it a spontaneous urge? D: Definitely a life long urge. I’ve never had a lesson. Self taught. I began playing guitar when i was 12 years old. I traded my ipod for my friend’s broken guitar. Since then I have not stopped. I later took on singing. K: Were your family/friends supportive of you making music and becoming a musician? D: At first no one took me seriously, and it was more of a hobby. Now my family and friends are very supportive of my career. It has been a long musical journey for me. D: No official dates or locations (are) confirmed. Stay tuned! K: In your opinion, what are the similarities and differences between music and fashion? D: Music and fashion are similar in the sense of being a form of expression. Both inspire and evoke many emotions in people. Both trends are constantly changing. Music aids our feelings while fashion displays our lifestyle. K: Are you interested in fashion? Are you fashionable? D: I love staying up to date with the latest fashion trends. I’ve been told that I am. K: What do you think of the modern fashion industry? D: I think it’s rapidly changing. I could say I’m fond of whats currently trending. K: Who/what is your ultimate inspiration? D: Elvis, Steve Jobs and Enzo Ferrari. They were innovators. K: What are your future prospects, both as a musician and as a person? D: I have many exciting projects to look forward to in the near future. I would like to form a clothing line. K: Any last words to your fans(including me : )) before we end the interview? D: I love all of my #Feiners. Stay tuned for many exciting things to come this year. K: Just one last random question-What’s your favorite movie and why? The interview was pretty short(sorry!) but nevertheless I hope you enjoyed reading it! Omg I love you Derik.